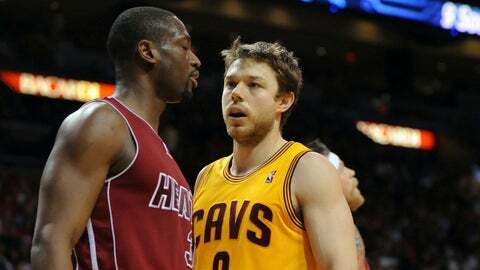 Cleveland Cavaliers shooting guard Matthew Dellavedova (right) exchange words with Miami Heat shooting guard Dwyane Wade (3) during the second half at American Airlines Arena. When your team plays with a sense of pride and determination in spite of the odds, it’s OK to get behind that team and start to believe. That is your Cleveland Cavaliers today, ladies and gentlemen. Yes, the Cavs dropped a 114-107 decision Saturday at Miami, and they made no excuses. That’s fine. I’ll make the excuses for them. The Heat were coming off three days rest, their previous game taking place in Tuesday’s loss to Indiana. The Cavs played the previous night, when they stole a come-from-behind win at Orlando. When you factor in LeBron James, Dwyane Wade and some horribly lazy officiating, it’s a wonder the Cavs even had a chance. But a chance they had — overcoming a 19-point deficit to take a four-point lead (95-91) in the fourth quarter. With three minutes left, they trailed just 102-100. Nobody wanted the Cavs to win. Not the Heat, not the league, not the network that gave the world The Decision Show back in 2010. Clearly, the refs had some sort of agenda, too — calling the game as if it were an audition for a starring role in "Three Blind Mice." Then they had the audacity to toss Cavs coach Mike Brown when he not-so-politely mentioned their disgraceful performance. Yet the Cavs were right there, sticking together and not allowing the world’s negative influences to weigh them down. This is what teams from smaller markets so often have to go through. They have to prove they are worthy of the world’s attention and respect. The San Antonio Spurs, Oklahoma City Thunder and Indiana Pacers have had to do it, and the Cavs will have to, too. But if these past few weeks are a sign, the little team from Cleveland is beginning to send some warning shots to the brighter stars in the biggest cities. Granted, no one may be taking much notice, given the Cavs’ mini-collapse and drama (real or imagined) to start the season. Today, the Cavs are 9-14. But they’re also winners of five of seven and starting to figure out some important things about pro basketball success. They’re defending better, they’re moving the ball better, they’re flat-out shooting better. Those improvements are the result of a mindset, a confidence that we haven’t seen from a team around these parts in some time. Kyrie Irving (19 points), Dion Waiters (16), Tristan Thompson (also 16, with seven rebounds) — this is the Cavs’ young trio on which we’ve been waiting. We’ve been waiting for each to really emerge, to discover where he fits, to attack and truly believe his team can win. And to truly hurt and get a little agitated when the Cavs lose. We are starting to see all of that. Just as we said when everything was going wrong at the start, we must point out that, yes, it remains very early. But just as the signs of defeat were so evident before — the subtle hints of a brighter future are here today. Obviously, it doesn’t hurt the Cavs are receiving contributions from just about everywhere. Veteran guard Jarrett Jack (14 points, five rebounds, four assists) is finding his groove. Veteran big man Anderson Varejao (six points, four assists, team-high eight rebounds) is doing what he’s always done. Rookie guard Matthew Dellavedova has been a basketball godsend. Every time he steps on the court, you get the sense that the Cavs’ opponent wants to clock the little guy. And that’s precisely what you want in a player and in a teammate. The Cavs aren’t the most talented team in the league. They don’t always give enough effort or live up to Brown’s motto of doing it "the right way." They still have plenty of lapses on both ends of the floor, and they still have to get center Andrew Bynum more involved on a regular basis. But suddenly, the Cavs seem to be getting closer to the team they believe they can become. And now, perhaps, you can feel a little more comfortable getting in the line that’s starting to form behind them.